Few people in Russia doubt that Dmitry Medvedev will win the presidential elections in March 2008, and expectations for his tenure continue to grow. The key problem he will face as president will be overcoming the inertia of Vladimir Putin's last years in office. Not much is known about president-to-be Dmitry Medvedev, but it is clear that his tenure in the Kremlin will only be successful if he improves the business climate. The fact that such a policy would bring him in direct conflict with most of the ruling elite, which is profiting from the absence of the rule of law, basic property rights and a coherent tax system, brings into question Mr. Medvedev's ability to achieve this, at least in the near future. In regards to his track record, accounting expert Yelena Matrosova of BDO Yunikon describes Medvedev as an "active participant in the political and economic reforms mostly credited to Putin." Alexei Makarkin of the Center for Political Technologies also gives Medvedev credit for liberalizing Gazprom's stock, which provided Westerners with the ability to invest in its assets and sent the company's market capitalization soaring to $345 billion (the third highest level in the world). During this time, Medvedev remained mostly behind the scenes. He will likely maintain part of this clandestine nature during his presidential tenure. However, Makarkin also thinks that Medvedev has a stronger personality than most people expect: "He will have to liberalize the economy, rid it of red tape, carry out major judicial reforms and adopt effective anti-corruption laws. Otherwise, his policies are doomed to failure even with windfall from high oil prices." Some experts believe that the Medvedev will improve the credibility of his reforms by presenting them under the guise of "Putin's plan," thereby throwing the weight of Putin's immense popularity behind them. Yelena Sharipova of Renaissance Capital comments, "Putin's plan is like the Bible - in it one can find a quotation to justify any economic step." Many experts also agree that for all the inevitability of economic liberalization, the government will continue socializing a number of industries. "The state first took over the most profitable raw materials industries, then it declared its interest in high tech products, and now it will turn to industries which business does not want to develop," predicts Matrosova. She believes that Russia is merely borrowing the experience of Japan, Germany and many other countries in consolidating problematic assets: "The state will take over sluggish industries, invest and then re-privatize." However, even optimists contend that serious improvements will not come in the near future. According to Makarkin, "2008 is lost because of the presidential election. 2009 will be spent fine-tuning the state apparatus. 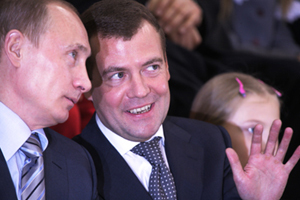 Only in 2010 can we hope to see Medvedev's policies begin to bear fruit." "RUSSIA AS THE "OTHER EUROPE"
"RUSSIA AND EUROPE: NO INTERMEDIARIES NEEDED"